Yesterday, we had Throwback Thursday, and I re-posted a blog on Throwing a Spring Flower Party… Well, today is Flashback Friday, and although I usually don’t like to re-post older blogs, and definitely not two days in a row, this one fits right in and I think (and hope!) 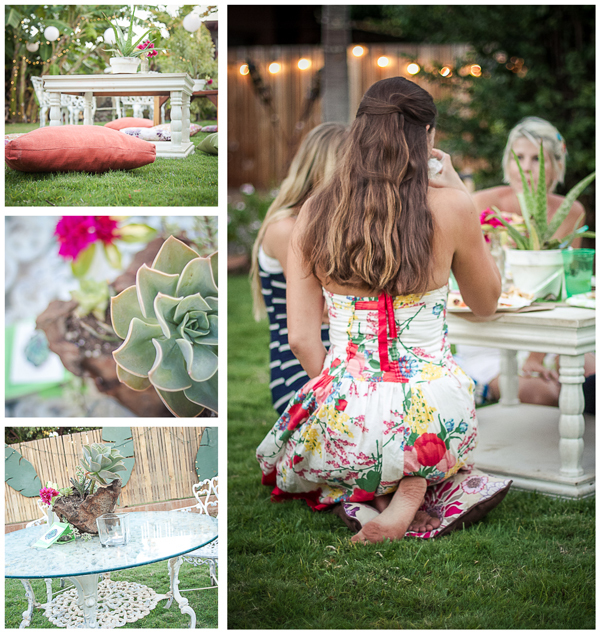 you all will like it… Today is all about Succulents and How to Throw a Succulent Party! Succulents started popping up in the wedding world a few years ago and they are still going strong. From bouquets and centerpieces, to succulent gardens and xeriscapes, these fun little plants are everywhere. 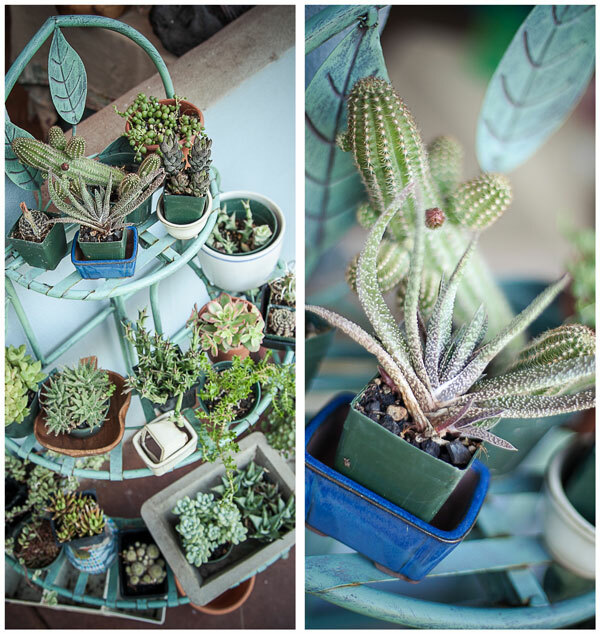 I personally love succulents, especially since they are super easy to care for, are very hardy and are eco-friendly! 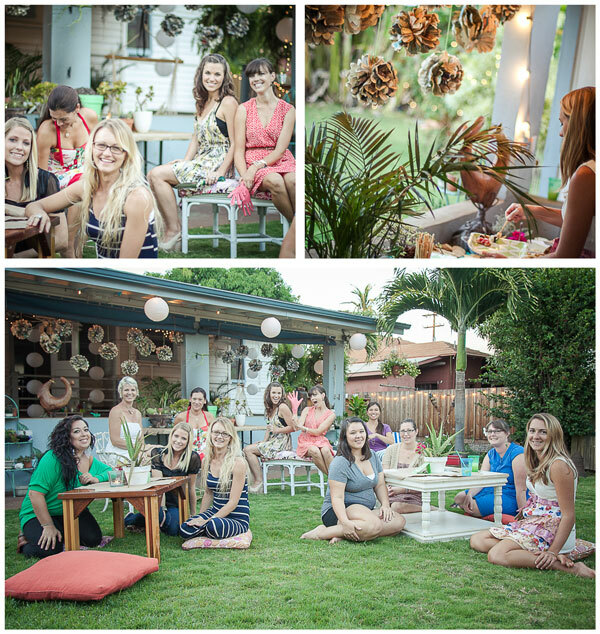 So, whether you want to gather your bridesmaids to help you make favors and/or centerpieces, or you just want to invite your friends over and have some fun, a succulent party is a unique and entertaining way to spend the day. Send invites to your party, the old-fashioned way! 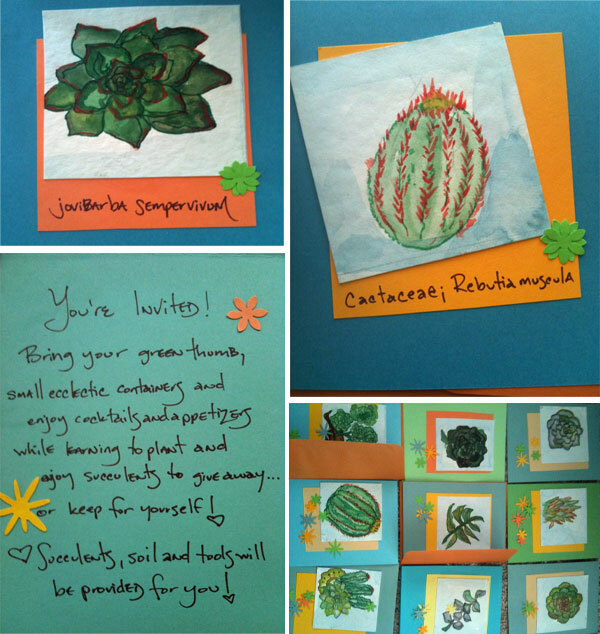 Have fun and spark interest by drawing pictures of different succulents and putting their official names on the front. If you are not artistic, you could cut out photos, or take your own photos, but try channeling your inner kid and give drawing a try, you may surprise yourself and the whole point is to spark creativity and have fun! 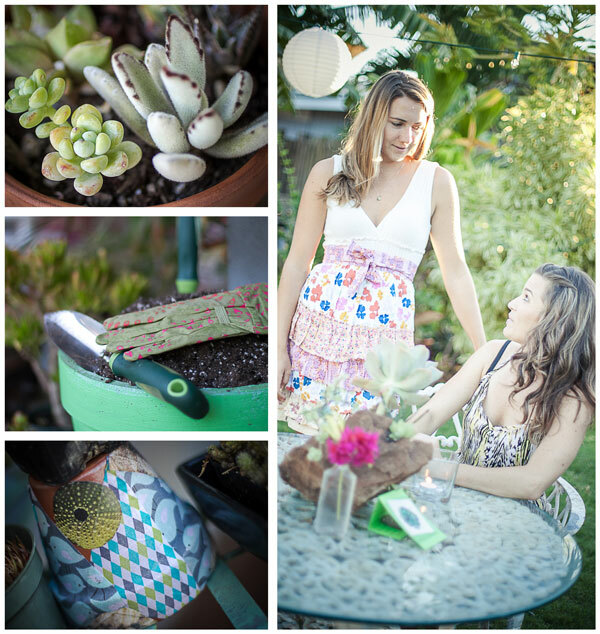 Encourage guests to wear ‘garden party attire’ that they can plant in, like the cute apron above! Before the party, you can decoupage a few pots for added ‘pop’ and plant some of your succulents for centerpieces and extra decoration. For comfortable outside seating, bring the indoors out and use pillows and low tables for a lounge-y, casual feel. 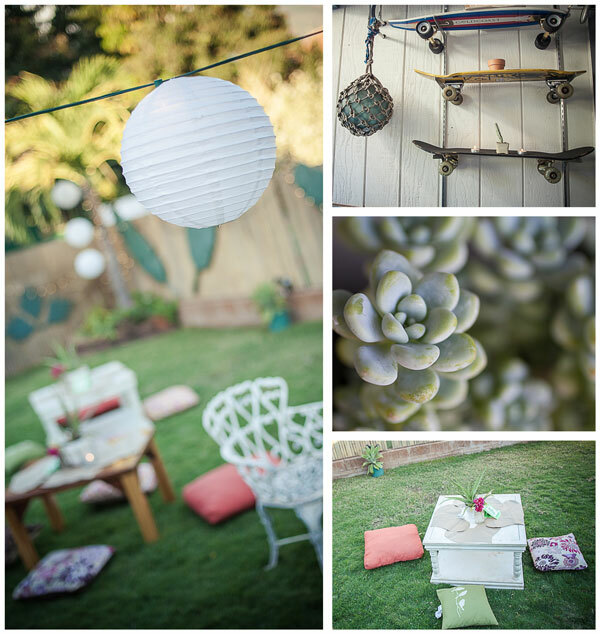 Small details like mini pots and tea lights add to the decor, while simple paper lanterns add ambiance. 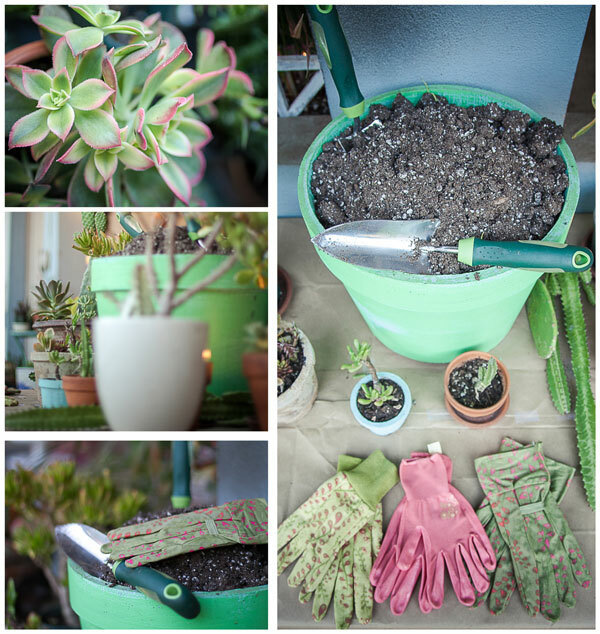 Provide succulents (be sure to get a variety of textures and colors), small pots (you can also ask guests to bring their own pots if they wish), potting soil, tools, and gloves to protect hands when handling spiny plants and cacti or just to protect that manicure of yours. Covering a few tables in kraft paper gives people a space to work without them worrying about getting your tables dirty. Succulents and cacti are in the same family, so for a xeriscape look, add some cacti to your party. Two plant stands did double duty as decor and an easy place to pick containers and product from. You can provide food and drinks or ask your guests to bring a dish to share for a potluck style meal. I mean, you’re probably gonna get hungry after all that work planting succulents and what’s a party without food and drinks?! That’s the main idea of this party anyways, right? So, who’s ready to throw a Succulent Party? I know I am!